Knee pain is a common symptom that may occur a few times in life without any discernible cause. Injury to the knee joint is very common and may affect any of the ligaments, tendons, or bursae surrounding the joint. The ligaments, cartilages, bones, and menisci forming the knee joint may also be involved in the injury. 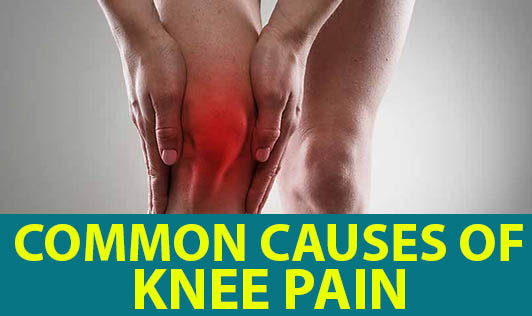 These injuries give rise to swelling and pain in the knees even on rest, with the pain increasing on bending the knees or putting weight on the joint when standing or walking. Tendonitis or inflammation of the tendon may occur either in front of the knee or back of the knee, since it is often produced by activities such as jumping, causes pain and swelling in front of the knee, just below the knee cap. Osteoarthritis and rheumatoid arthritis are common causes of pain and swelling of the knee joint, along with restricted mobility. Baker's cyst or popliteal cyst is a localized collection of fluid at the back of the knee, often following arthritis, and is a frequent cause of pain and swelling at the back of the knee. Bursitis of the knee may occur on the inside of the knee or in front of the patella. The latter is also known as "housemaid's knee" as it occurs most commonly due to kneeling and putting excessive pressure on the knee cap. Runner's knee (also referred to as anterior knee pain) is not restricted only to runners and is a common cause of knee pain in young people. There may be diffused pain behind the patella - aggravated by climbing stairs, running or jumping, or it may even occur after prolonged sitting.